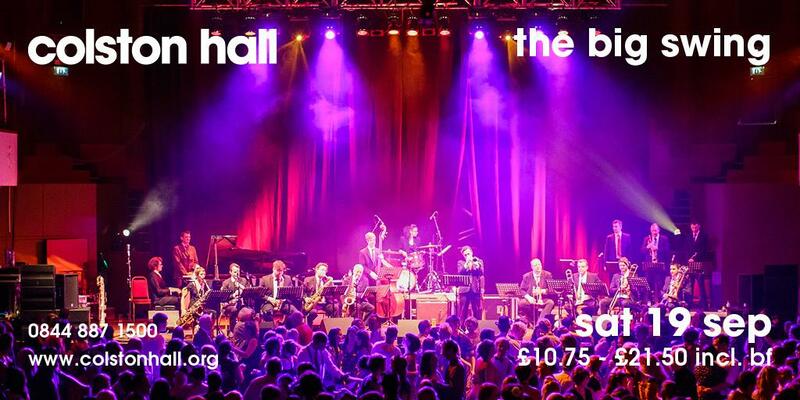 Dust off your dancing shoes because Bristol’s biggest swing dance is back at Colston Hall. With music from the Big Buzzard Buzztet and the inimitable Bruce/Ilett Big Band, dancers of all abilities, as well as those who prefer to spectate, are welcome. If you wish to spectate please select a balcony ticket. Free swing lesson included from 7:30 – 8pm. Bands start at 8pm. Part of Bristol International Jazz & Blues Festival’s September Swing. Denny Ilett and Jonny Bruce share a love of classic swing era big band music, in particular that of the worlds greatest trumpeter Harry James. An idea to feature Jonny’s powerhouse trumpet in recreations of Harry James’s finest moments was born. The aim is simple: to play some of the finest swing era music ever written to a room full of people dressed up and dancing together! Along the way, some of their other (and Harry’s) favourite bandleaders entered the fray such as Duke Ellington, Woody Herman, Count Basie, Benny Goodman, Ziggy Elman, Bunny Berigan. The band play faithful and authentic versions of these artists biggest hits for dancers and listeners alike. Having a fabulous night @Colston_Hall with the Bruce/Ilet Big Band #show106664 Great big band music and amazing swing dancing!